US Secretary of State Rex Tillerson shakes hands with Chief of Army Staff Qamar Javed Bajwa, with Pakistani Prime Minister Shahid Khaqan Abbasi, center right, Tuesday, Oct. 24, 2017, in Islamabad,Pakistan. Islamabad - US Secretary of State Rex Tillerson got a frosty welcome to Pakistan Tuesday after Washington turned up the heat on Islamabad for allegedly providing "safe havens" for Taliban militants. America's top diplomat was quietly greeted by a mid-level Pakistani Foreign Office official and the US ambassador David Hale at the military airport in Rawalpindi, an AFP photographer saw -- a welcome that, while marked with smiles, was devoid of the pomp that usually accompanies high-level visits. He was then driven in a convoy amid tight security to the US embassy in Islamabad's diplomatic enclave, before meeting with Prime Minister Shahid Khaqan Abbasi, the powerful military chief General Qamar Javed Bajwa, and other top officials. It was not clear how long the meeting lasted, but the secretary left Pakistan for India Tuesday evening, less than four hours after landing. 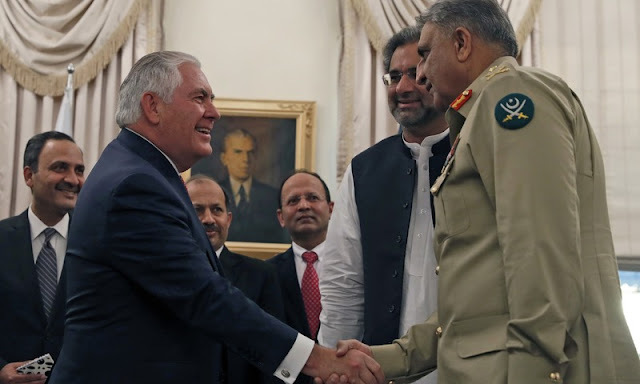 The visit was the first to nuclear-armed Pakistan by a senior Trump administration official and comes months after the US President angrily accused Islamabad of harbouring "agents of chaos" who could attack US-led NATO forces in neighbouring Afghanistan. It follows on the heels of an unannounced stop in Afghanistan Monday, where Tillerson reiterated America's commitment to the country and warned that Washington has made "very specific requests" of Pakistan over militancy. Washington and Kabul have long accused Islamabad of supporting Afghan militant groups including the Taliban. They are believed to have links to Pakistan's shadowy military establishment, which aims to use them as a regional bulwark against arch-nemesis India. Pakistan has repeatedly denied the charge, insisting it maintains contacts only to try to bring the militants to peace talks. During his Afghan visit Monday, Tillerson told reporters Pakistan needs to "take a clear-eyed view of the situation that they are confronted with". US Secretary of State Rex Tillerson got a frosty welcome to Pakistan Tuesday after Washington turned up the heat on Islamabad for allegedly providing "safe havens" for Taliban militants. America's top diplomat was quietly greeted by a mid-level Pakistani Foreign Office official and the US ambassador David Hale at the military airport in Rawalpindi, an AFP photographer saw -- a welcome that, while marked with smiles, was devoid of the pomp that usually accompanies high-level visits.